Wall Murals allow you to change the look of a room in the space of a day with a burst of color and high resolution images. Our talented team of professionals can help you choose the right type of image at the proper resolution for the large sizes required for wall murals. We suggest this solution for such locations as dentist offices, museums, libraries and churches. This application is great for a location that has lots of white area that they want to decorate quickly. 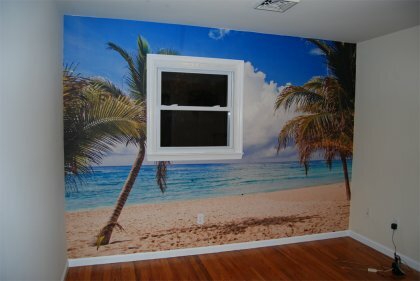 Imagine a full stadium photo or an ocean scene where your white wall used to be! We have a wide variety of free and paid images to choose from. We can send ideas via email superimposed on actual photos of your establishment or you can schedule an appointment with us to sit down and be a part of the creation process. We love having people come to our showroom so you are always welcome! Our location is convenient and easy to get to, just a few miles east of the I-25 corridor. Wall murals aren't just limited to images. These graphics lend well to inspirational sayings that are carefully crafted into your image. Our design programs make it easy for you to blend your images with quotes, graphics or whatever you can imagine. We don't limit this option to places of business, we'll customize any room that you like! 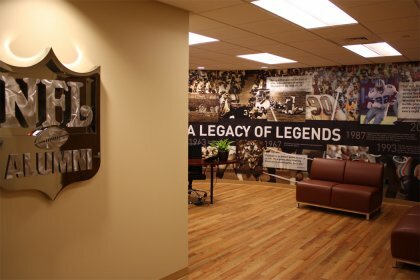 These images demonstrate the power of wall murals and customized interior wraps. What you can do is only limited by your imagination.